You can trust me, Julianne Deely-Frost, with one of your biggest investments – your home. Why? Because I won’t just treat you as a client, I will treat you as a friend. I spend time to understand your goals and then do the job to see that those goals are met. I already know the best stagers, professional photographers, lenders and reliable contractors to call on when needed to help sell your home. That means you will have the best resources in the business working for you. Many of these same resources have also trusted me to help them sell or buy their homes, including my dentist, electrician, stager, and bathroom contractor, to name just a few. I’m not saying that to brag. I’m telling you that so you’ll know that people who know me and work with me have chosen me for one of their biggest decisions. I think that says something about my character and trustworthiness. I've also earned top sales awards in my office for the past several years, including the Chairman's Circle. I’ve been in the real estate business for 16 years and I’m well-acquainted with Fishers, Indiana and the surrounding communities of Hamilton County. Call or email me and let me put my experience and expertise to work for you! Fishers, Ind. Ranked Best Place to Live in 2017 by Money!! Give me a call and I'll help you find a place to live in this wonderful city I'm proud to call my home! Chairman's Circle Award Winner Again! 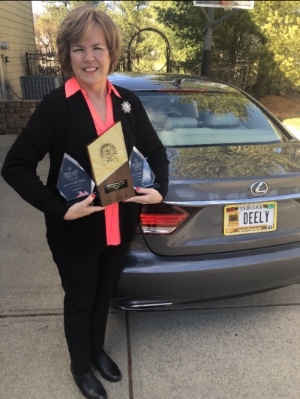 In February 2019, I was honored with a Chairman's Circle Gold award, which means I am in the top 2% of Berkshire Hathaway HomeServices Network agents nationwide. It is my honor to have been able to assist my clients with their real estate needs over the past year and only because of them that I have achieved this award. I will always value you as my client and be proud to serve as your Trusted Advisor in all your real estate endeavors! Former model, luxury ranch condo: 2 BDRM, 2 full baths, oversized 2 car garage is move in ready and maintenance free. Fresh paint and new carpet on 3/19, new AC and water heater 2018, granite kitchen counter-tops, coco glazed cabinets, Jenn Air gas range. All kitchen appliances stay & W/D stays. Bamboo hwd floors in Great Room, Dining Room, and Kitchen. Cathedral Ceilings and a beautiful sun room. Ceramic tile in laundry room and bathrooms. Amenities include pool, club house, exercise room. Condo fees include ALL exterior maintenance, lawn care, snow and trash removal, sewer bill, club house, pool, maintenance of common area.